Aaron Copland was active as a pianist throughout most of his musical career, giving up piano performance only after 1970, when he concentrated on conducting. He continued to record performances of his own music through much of the LP era, although only as a collaborator in chamber works and his Piano Concerto. 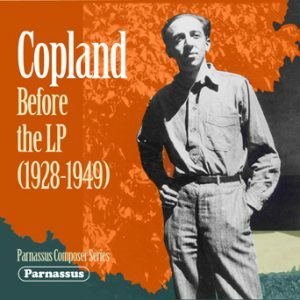 The present CD collects for the first time all of Copland’s pre-LP recordings. While most of them have been issued on LP or CD before, they have never all been available in one place. Further, they are now presented in splendid new transfers by Mark Obert-Thorn, who was able to locate copies of all of the originals including the ultra-scarce New Music Quarterly side. The piano roll of “The Cat and the Mouse” is published in any audio recording for the first time. Copland said he had never performed any other composer’s piano music in public. But his technique was strong enough to support the powerful performance of his Piano Variations and, later, of his Piano Concerto. This restoration of his earlier piano recordings is a valuable document of a major composer showing how his own music should go. His collaborators in these recordings include two major violinists, Jacques Gordon and Louis Kaufman, and Copland’s long-time friend and collaborator, the composer and pianist Leo Smit. Royalties on this CD are being paid to Copland House, an award-winning creative center for American music based at Aaron Copland’s National Historic Landmark house near New York City (www.coplandhouse.org). Special thanks to Peter Bay, Jim Cartwright’s Immortal Performances, Inc., Michael Gartz, Donald Manildi, Karl F. Miller and the International Piano Archives at the University of Maryland (IPAM) for providing source material. Parnassus CDs are distributed in the U.S. by Alliance, in Italy by La Tosca, and elsewhere by alto distribution and associated distributors.